Penny’s Gift Baskets packaging services enable our clients to promote their products unique branding. We create cohesive designs showcasing your branded products to stand out and captivate the audience. 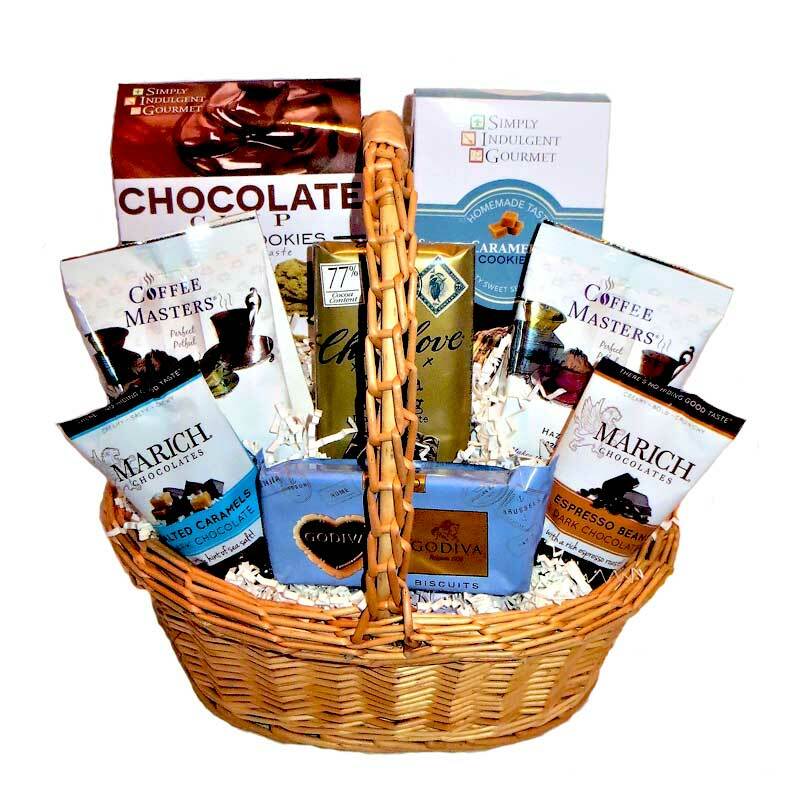 The custom designs utilize colors, patterns, and textures to create Gift Baskets that brand your products or services. The design creates a visual impact to help sell the product. Packaging can be a powerful tool to communicate what makes your company memorable and showcase that unique brand. We work with clients to understand the purpose and vision of the branded product. 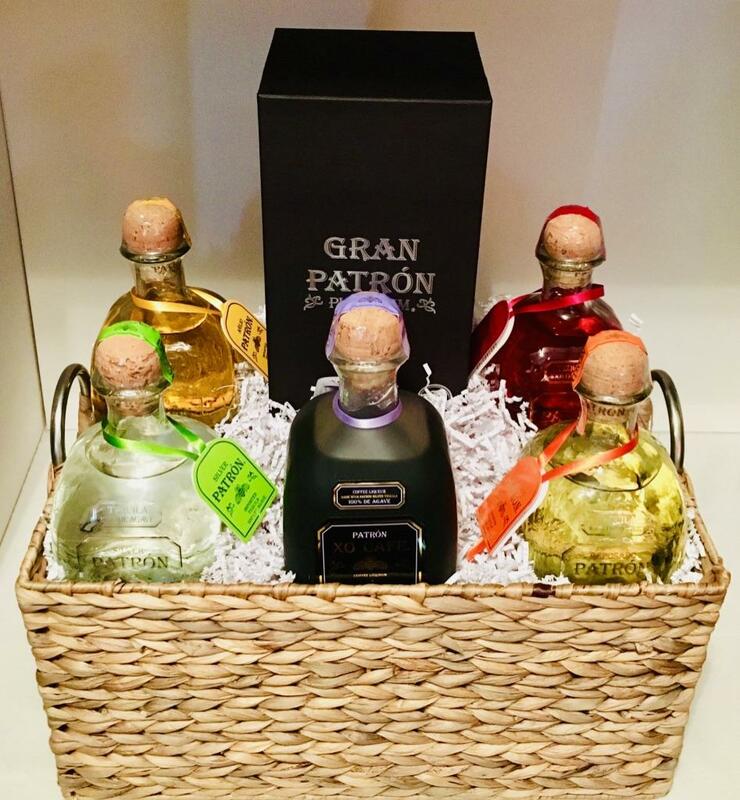 The Patron Spirits Gift Basket was designed to showcase specialty tequilas. The client requested we pay special attention to the small batch signed tequilas in the wooden boxes. We merchandised the bottles to highlight their importance. Warm tones, individual packaging designs, and textural details were merged to create a cohesive design. We work with our clients to help brand and merchandise their products. This client requested the Gran Patron Platinum to be the focal point for the design. The design, shown in the photo above marketed each tequila while cohesively merchandising the Patron Spirits brand. The design minimized visual distractions of colors by displaying only the etched Patron Spirits branding. Small details, such as, handles of the baskets to repeat the shape of the stopper of the Patron Spirits create a unique one of a kind custom design. Randolph Brooks Federal Credit Union (RBFCU) wanted to thank four local synergy partners for their attendance at the Ribbon Cutting celebrate of their new McKinney, Texas location. One Gift Basket for the McKinney Chamber of Commerce, included multiple branded items for nine different employees. The basket also featured local gourmet items from Goodies Texas, Mom & Pop Corn, and Loco Cowpoke Salsa Shop in downtown McKinney. 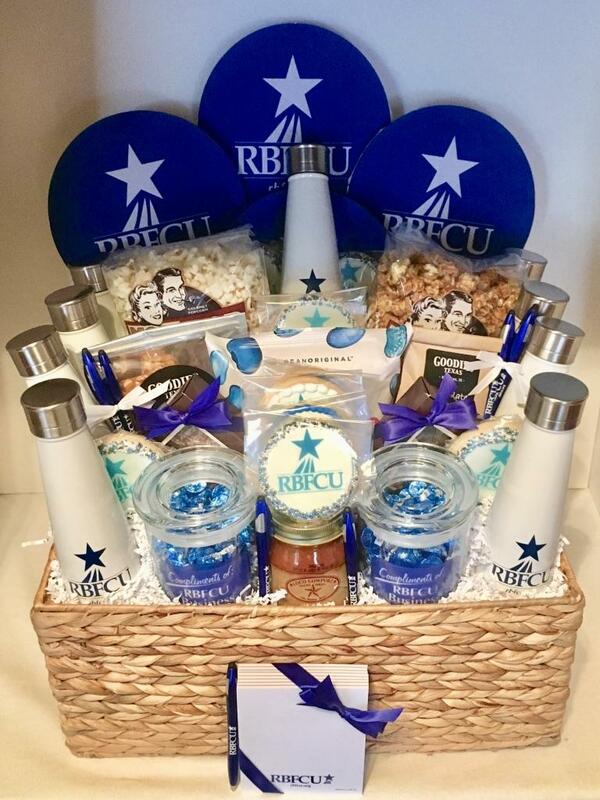 We focused on the branded RBFCU products in the overall design of the Gift Basket. Sometimes a client will request a themed gift. 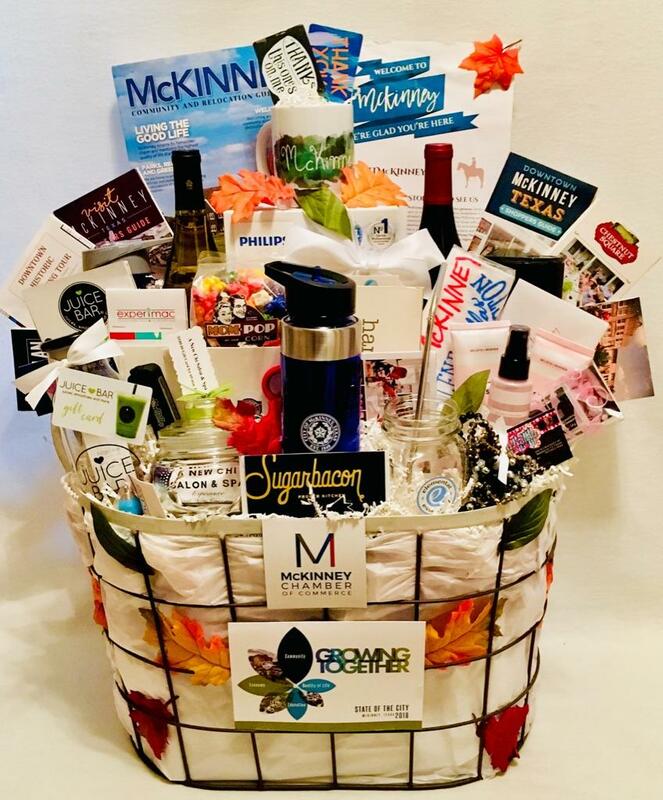 This Gift Basket was designed for the McKinney Chamber of Commerce to celebrate Chamber of Commerce Week 2018. The products highlighted McKinney, Texas, the Chamber of Commerce, and featured donated items from chamber members. The design focused on marketing McKinney, Texas and highlighting the McKinney Chamber of Commerce. A Gift Basket design with branded product should tell a story and remain true to a company’s product vision. We assist companies with a custom packaging experience. We focus on the products colors, shape, and familiarity; utilizing the brand to connect emotionally with the consumer.